One of the great perks of living right outside of New York City, which I have done for nearly two thirds of my life, is being able to enjoy the theater in New York – and the classic format for writing a dramatic play is to present it in THREE acts. So l thought that today we’d take a look at today’s Gospel account from Matthew in that same format. Here we have here a debtor who owes his master ten thousand talents. Now a talent was an amount of money equal to one thousand denarii – and a SINGLE denarius was a Roman silver coin equal to one day’s labor. If you do the math, the TOTAL amount of the debt equaled ten million days’ wages. Responding to the debtor’s request, the king, in an act of subtle sensitivity, changes the obligation from a debt to a LOAN. Was he NUTS? He MUST have been! How could he POSSIBLY think he could pay back the HUGE obligation that he owed his master? Now, setting aside the man’s OBVIOUS psychiatric condition, let’s take a look at his SPIRITUAL state which, of COURSE, is what Jesus is talking about. We should also keep in mind that Jesus is talking about YOUR spiritual condition – as well as mine. ALL of Jesus’ parables are NOT about OTHER people – they are ALL about you and me. And the POINT of the Act I? The debtor was concerned ONLY about observing the dictates of the law. His arrogant self-righteousness REMAINED. His focus was ONLY on himself. There was NO change in the debtor’s heart – only an attempt to manipulate laws, rules and regulations. Now filled with his own self-righteousness the debtor went out and found a fellow servant, one of his PEERS – who owed him a small amount of money. It amounted to only one hundred days’ wages – a miniscule sum compared to the ten thousand talents that he himself owed. Instead of treating his fellow servant – his equal – with a changed heart – he treats his fellow servant to a strict application of the law and after CHOKING him has his fellow servant thrown into debtors prison. And the lesson HERE? You can offer forgiveness to someone who has sinned against you – but it won’t be effective if he or she has not repented and asked for forgiveness. The parable is pointing out that even GOD can’t forgive someone with a HARD heart! It’s called “sinning against the Holy Spirit” – the ONLY unforgivable sin. It’s unforgivable because the sinner does not allow himself to be influenced by the Holy Spirit – or by God’s tender, loving mercies. The king THEN acts on behalf of the powerless. He exercises legal judgment – and employs the law on behalf of the poor and powerless fellow servant. AND he NOW applies the FULL force of the law against the debtor who owed him the ten thousand talents. We need to see here that God comes to us looking for change in our HEARTS – NOT simply a change in our ways of thinking and acting. Simply changing our ways are “EXternals” – not “INternals. My brothers and sisters – it’s your HEART that God wants. The old law of “an eye for an eye, and a tooth for a tooth” was designed to control and contain our vengeful attitudes and our lusts to “GET EVEN”! If one was limited to an eye or a tooth – one could not go BEYOND those boundaries and then kill in the name of justice. Nevertheless – “getting even” – REVENGE – is very much a part of our ways of doing things – even in today’s world. All one needs do is to pay attention to the news headlines that confront us daily. Our world is still held hostage to notions of “GETTING EVEN” – believing that justice will be served in that way – or that some sort of balance will be restored. We see that today in the Middle East …and CERTAINLY in the political arena in Washington. The world is more concerned with getting even with THEM before THEY get even with us – instead of working TOGETHER to come up with a way that in the END we are ALL even. leads us to “an eye for an eye, a tooth for a tooth” approach. Living under the LAW leads us to attitudes that seek retribution and justice ALONE – without any change in our hearts. Many of us cling to RESENTMENTS – living in horrible prisons of pent-up ANGER – LOCKED in the grip of resentments and LOST in our lusts to “get even”. THIS then throws us into victimhood. We feel like we are victims and seek ways to find ONLY compensation, revenge and retribution. We live merely under the law. Amen I say to you – Jesus Christ is RISEN from the dead He is victim no LONGER. He is totally FREE because he is totally FORGIVING. “AS” is the controlling word in that sentence. 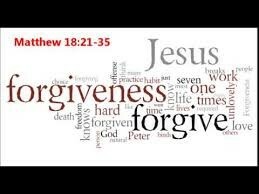 We will be forgiven “AS” – to the length, height and depth that we measure out forgiveness to others – all the while remembering that the people we forgive are TRULY forgiven only if they repent – convert their hearts – and then actually accept forgiveness. For forgiveness to work BOTH parties must be involved. Forgiveness is NOT “selling out”. Forgiveness is NOT saying that what people have done to us is somehow “okay” – or that it doesn’t matter. Forgiveness liberates us from the ways of this world. Forgiveness takes us into the very heart of God. To forgive is truly divine – and the presence of God is something that we ALL desperately NEED in our lives – particularly in these troubling days in which we live. “Wrath and anger are hateful things, yet the sinner hugs them tight. The vengeful will suffer the LORD’s vengeance, for he remembers their sins in detail. Forgive your neighbor’s injustice; then when you pray, your own sins will be forgiven. Could anyone nourish anger against another and expect healing from the LORD? Could anyone refuse mercy to another like himself, can he seek pardon for his own sins? If one who is but flesh cherishes wrath, who will forgive his sins? And so TODAY let US — lets YOU and me — enter into the heart of God and find freedom for ourselves – in the forgiving of others.